This is our fifth year participating in the Great Backyard Bird Count at the Mill. The actual event this year is February 17-20 but we will be participating the week after due to other conflicts. We spend about an hour in the mornings at the Mill, counting the birds we see. A trained ornithologist will be present. We are happy to participate in this event every year. You are invited to our spring fundraiser: a special painting party at Paula’s Public House in Poughkeepsie, presented by Hudson Valley Drip and Sip. Everyone in attendance will get the opportunity to paint a picture of their own (image below) and take it home to display. Each general admission ticket will include the painting and one free glass of wine. Additional drinks and food may be purchased from the bar. All proceeds will benefit the Cider Mill Friends! This open house is aimed towards the Vassar College Alumni that will be present for Reunion Weekend, but we welcome everyone to attend! This is our second year participating in the Historic Tavern Trail series of events. These events take place at various historic sites throughout Dutchess County. The event at the Kimlin Cider Mill is a Prohibition-era Lawn Party theme. The event will include light food by Chocolate Mousse Catering, summer cocktails, tours of the 100-year-old cider press, music, raffles, and of course lawn games. Event is rain or shine. Cost is $20. 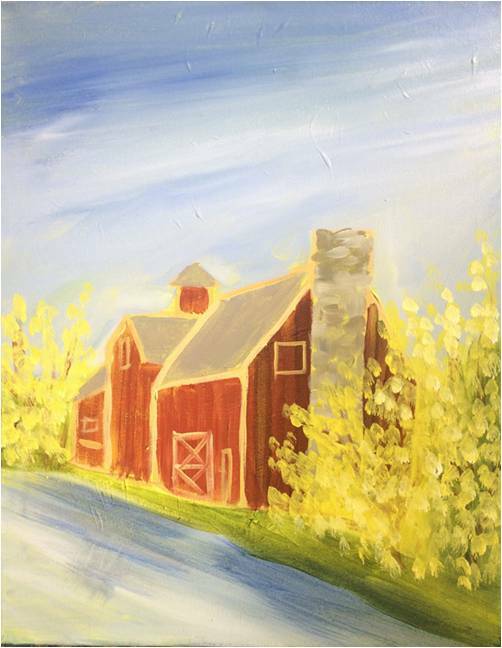 Proceeds support historic events in Dutchess County and the restoration of our cider mill. You can RSVP on the Meetup page, but are not required to RSVP in order to attend (https://www.meetup.com/DutchessTavernTrail/). We will have a booth at this annual event. Come by the street fair on Raymond Avenue in Poughkeepsie and say hi! This will be our 5th annual “old-fashioned” cider tasting event, featuring numerous local ciders (hard and sweet) including our own Kimlin Sweet Cider, food, live music, behind-the-scenes tours, entertainment, and raffles. More information can be found here. This year we are excited to have our cider tasting be part of the Taste of History, a time in October to enjoy the offerings of various historic sites in the mid-Hudson Valley. Museums will either have foods on location that have historical significance to their site or partnering with local restaurants offering discounts. Check out the link for more information. Formerly known as the Fair Trade Bazaar, the Fair Trade & Handmade Bazaar event has fair trade items from around the world for sale, plus local artisans and non-profit organizations as vendors. CMF will have a booth at this event, so come by and check out the event. The event takes place at the Hellenic Center, 54 Park Avenue, Poughkeepsie, NY.